Mapnik is a very complex and powerful library for rendering maps that comes almost entirely without documentation. A wiki exists, but as for OpenStreetmap itself, it is impossible to know which information is current and which is outdated. So users of Mapnik should be aware that they may need to go down to the source code to obtain information they need. The rude title is designed to remind you of that. Mapnik is written in C++ but also has Python bindings. The Python functions are a bit more high-level, saving you some hassle. The Python API also used to be the only one that was documented . Unfortunatly this has changed for the worse, in that as of Mapnik 3.x, the Python bindings are not documented any more. In addition, they have been moved out of the Mapnik repository to a separate one . Considering that Mapnik does not even try to provide up-to-date docs, one should not expect the Python bindings to be kept up to date. Splitting a repository opens the way to different update schedules. It also opens the way to extra trouble when having to build an additional project. For that reason I cannot recommend using the Python API any more, and this page will exclusively deal with C++. The Map class also has a register_fonts() method that can be used to set the font directory after creating the map object. Both register_datasources() and register_fonts() have a second argument of bool type that activates recursion through subdirectories. Unless you want to render a world map, you have to tell Mapnik which region to render. This is done by constructing a box2d object. As you will normally know the boundaries of the region in latitude and longitude rather than the coordinates of your map projection, you also have to project those latitude/longitude values to your map's projection with a projection object. The following example assumes your map uses the pseudo-mercator projection that is the default for OpenStreetmap PostGIS databases. Presumably the projection in the third argument of the Map constructor has to be the same as in the map style file and in the code calculating the map region. save_to_file() accepts an image type string as a third argument, which can be "png", "jpeg", "tif" or "webp". Otherwise the type is inferred from the image file name. My simple rendering program renderosm.cpp is here. The code snippets above were taken from it. Another example of a simple rendering program is mapnik-render that comes with the Mapnik library. The source is on the web here . Mapnik style files are XML files containing tags describing map features. There is documentation for some of the tags in the Mapnik wiki. This page is a good starting point. However one should be aware that wiki pages are not necessarily up to date. The map contains a set of layers and corresponding styles. The styles describe the appearance of map features, while the layers define the data sources and rendering order. Layers placed later in the style file draw over earlier layers. The position of Style tags in the file does not matter. A Style tag contains one or several Rule tags that describe the appearance of a feature. Different rules in the same style usually contain qualifiers that make them mutually exclusive, such as map scale ranges or restrictions to different features. The Datasource tag specifies how mapnik obtains the features it renders into a map. It typically has several <Parameter name="name">value</Parameter> child tags. The parameter with name "type" specifies the type of data source, and different datasources allow (and require) different additional parameters. The data source types most relevant for OpenStreetmap rendering are postgis and shape. The most important parameter, the coordinate system (= spacial reference system = map projection) used in the data source, is not specified in the Datasource tag at all, but rather in the srs attribute of the Layer tag that uses the data source. That makes it possible in principle to keep quantities using different coordinate systems in the same data source. The table parameter can be the name of a database table such as planet_osm_point in its simplest form. But that would fetch the complete table from the database and leave Mapnik to filter out the features to be rendered from the table. Database servers are much better at that kind of filtering, as it is one of their main jobs. Fortunately PostgreSQL supports the sub-query feature of the SQL database query language. Its basic syntax is (<query>) as foo, where <query> is an SQL query and foo is an arbitrary identifier. Such a sub-query can be used in a database query where otherwise the name of a table would be required, and if you put a sub-query into the table parameter, Mapnik will do just that. In the OpenStreetmap standard style, all table parameters are sub-queries. More complicated examples can be found in the standard OpenStreetmap style , from which the above were also taken. This page documents more parameters for postgis data source, and this page describes optimisations through sub-queries and extents and gives examples of database queries performed by Mapnik for different choices of parameters. For more on SQL queries, read the PostgreSQL documentation . This page has more examples and some syntax documentation. Several parameters of the data source tag relate to different ways of obtaining the extent, which in this context seems to mean the maximum region for which a data source provides data. The parameters seem to apply only to data sources related to PostGIS, postsgis and pgraster. The extent can be given explicitly in the extent parameter, which causes Mapnik to restrict queries to that region. This duplicates the information of which map region to render (I do not know who thought that up, or what they have been smoking). Its syntax is four floating-point coordinates separated by commas, interpreted as longitude 1, latitude 1, longitude 2, latitude 2 in the projected coordinate system (which is also the coordinate system of the database). Note that if you put that into a style file, you will not be able to use it for rendering regions outside the extent, even if the database covers them. If the extent is not given explicitly, Mapnik tries to determine the maximum extent of the database contents using a PostGIS query. Why it does this is a mystery, as that maximum extent can place no additional restriction on data queried for rendering. The parameters estimate_extent and extent_from_subquery are designed to make this more efficient, by obtaining an estimate only or not operating on full tables, respectively. In my limited experimentation, estimate_extent worked almost as well as a hand-coded explicit extent. extent_from_subquery seems quite useless with styles like the one of OpenStreetmap, as its subqueries select by type of feature and do not reduce the geographical spread of query results. This data source supports files in shapefile format. Such files are basically georeferenced vector data, just as raster files (GeoTIFF for example) are georeferenced pixel data. OpenStreetmap uses it for the outlines of continents and for borders and administrative boundaries, which are obtained from extraneous sources. Shape files can also be generated with the GDAL library and utilities to obtain contour lines from raster elevation data. The only obligatory child tag has the name file and the shape file name as its value. (Of course the type parameter is also needed, but that is not shape file specific.) According to the Mapnik wiki page , the encoding of text in the shape file can be given in an optional parameter. Mapnik also supports a csv (comma-separated value) data source type, a plain-text format common on Windoze that is well suited for quick addition of supplementary data. The data source allows integrating data into the style file by using the inline parameter. See here for more information and several examples. The CSV data source is documented on this wiki page . There seems to be no documentation page giving an overview of all (potentially) available data sources. My installation provides the following: CSV , GDAL , GeoJSON , OGR , PgRaster , PostGIS , Raster , Shape , SQLite , and TopoJSON (apparently a variant of GeoJSON ; undocumented). The Datasource tag supports a kind of inheritance. It works with two tag attributes (not parameter child tags), name and base. A base attribute with a value equal to the value of the name attribute of a different Datasource tag causes its parameter child tags to be inherited. This is quite useful for setting most of the parameters of a PostGIS database source in a Datasource tag at the top level and later referring to it and specifying the table parameter. 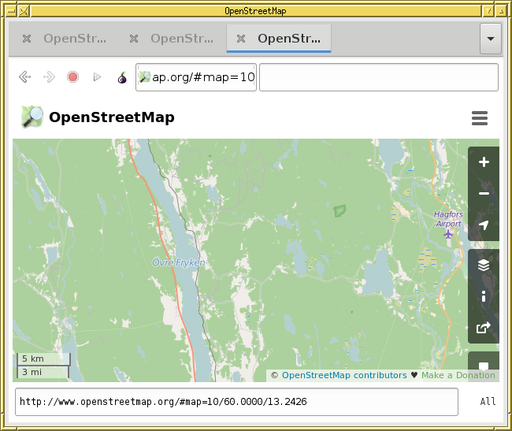 The standard OpenStreetmap style uses XML entities for that purpose, even though Mapnik's current default build does not support them. Symbolizers are child tags of Rule tags that control what is drawn on a map. The graphical object they specify is drawn at the coordinates of the map features to which the rule applies. They are comparatively well documented. Most symbolizer tags have no content, with the exception of those drawing text. Most have a file attribute referencing an image, usually in PNG format. If applicable, the values of colour attributes can be a word ("white" etc.) or a # followed by three or six hexadecimal digits giving the RGB value. Most symbolizers have an attribute for partial transparency/opacity. Database content from a PostGIS data source can be inserted into attribute values or textual content by specifying the database column name in square brackets, for example [name]. The same syntax applies to attributes in shape files, such as [elev] for the elevation of a contour line if the shape file was generated appropriately. The following is a brief and incomplete overview. The linked pages provide details on individual symbolizers, and the Rule tag documentation on this page contains a full list. Draw icon at point-like map feature (bus stop, viewpoint, etc.) or inside extended feature. The file attribute contains the image file name to use for marking the points. Draw line along linear map feature, such as a footpath or a railway line represented by a line at large scale. Width, colour and dashes can be chosen by the attributes stroke-width, stroke and stroke-dasharray. Repeatedly draw a template image (from the file attributes) along a linear map feature. The x coordinate of the image is along the line, the y direction perpendicular. The height of the image is the width of the resulting line. The line runs from left to right in the image, i.e. the lower part of the image is drawn to the right of the direction of a way. This allows to indicate which side of the line is which, such as for cliffs. Fill polygon interior with a colour, given by fill attribute. Fill polygon interior with tiled pattern from file. Draw text at a point, along a line (road names) or inside a polygon. The text is the content of the tag. The attributes size, fill and halo-radius give the text size, colour and the width of the underlying "halo" that makes the text readable on top of similarly coloured backgrounds. There are many more attributes specifying the layout, position, font and other things. Draw an image with text on top, such as a highway symbol and identifier. The text is the content of the tag. The file attribute gives the image file, and the same attributes as in the TextSymbolizer apply to the text. Draw a georeferenced raster image given in the file attribute. A useful attribute is opacity, which allows the image to be drawn partially transparently so that lower layers can still be seen. Clearly a pixel size has to be implicit in these restrictions, considering reality is measured in length units while the size of a digital map is in pixels. That pixel size is documented as 90 pixels per inch , or 0.28 mm per pixel. Even though zoom levels correspond to map scales, the scale indicators of 10 km and 5 km, respectively, are the same size. This means that the real map scale for a given nominal scale (which determines the style) will vary by up to a factor of four (latitude 75° in Greenland or the Taymyr peninsula in northern Russia). This is the reason printed world maps practically never use Mercator projection, but accept angular distortion in exchange for a more consistent scale. The scale of Mapnik's scale qualifier tags always refers to the equator. The projection is specified in the srs attribute of the tag in question. Its value is a string containing option undestood by proj (docs listed here). The projection of the layers using the OpenStreetmap database as a data source has to be the same as the one chosen when running osm2pgsql to import the OpenStreetmap data into the database. The old standard OpenStreetmap style uses other data sources defined in different projections, such as boundaries of adminstrative regions and towns. The map projection of the Map tag determines the projection of the map that Mapnik renders. It can be chosen arbitrarily, as Mapnik transforms data from data sources as needed (using the proj library). All have their individual advantages and drawbacks. In this section, I show a comparison of three projections for Scotland and northern England. The two documentation PDF files linked in the proj documentation section desribe most projections in some detail. XML entities are in effect constant declarations in XML files that can be referenced later and in multiple places. They also allow including other XML files. 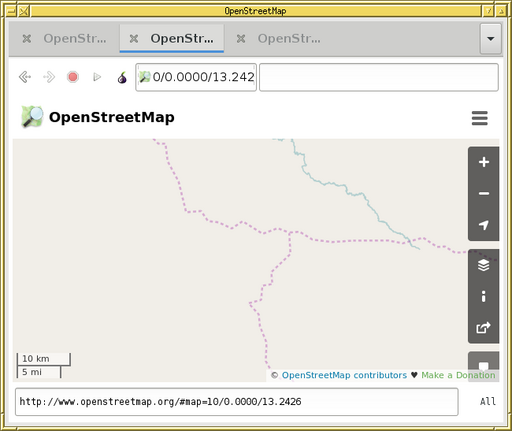 The old standard OpenStreetmap style uses them to reduce the size of the style files and prevent duplication. The important thing to know about Mapnik and XML entities is that Mapnik supports them only when built to use libxml2. Since version 3, this is not the default . Besides I have encountered buggy development versions that did not support entities even when built with libxml2. An apparently out-of-date wiki page recommending their use should probably be disregarded now. For data source parameters, the inheritance feature of the Datasource tag is a convenient replacement.